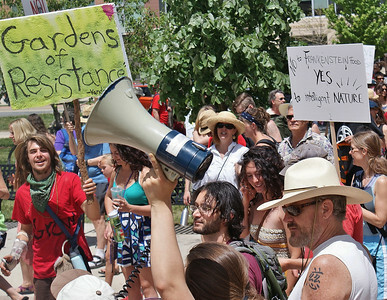 "March Against Monsanto", Boulder, Colorado, 5/25/13. 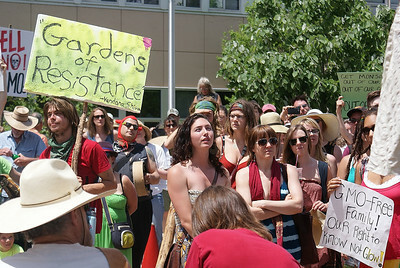 Young women in protest march, anti-Monsanto sign in background. 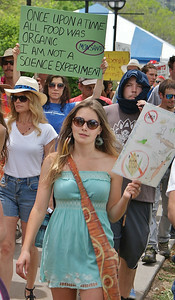 Young woman marching with ant-GMO sign, other protesters behind her. 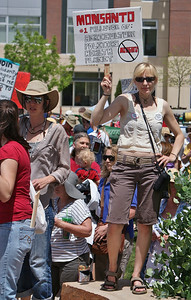 Woman with sign "Hell No to GMOs", other pritester in background. 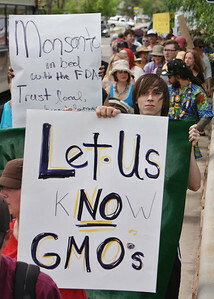 Young man with ant-GMO sign, long line of protesters behind him. 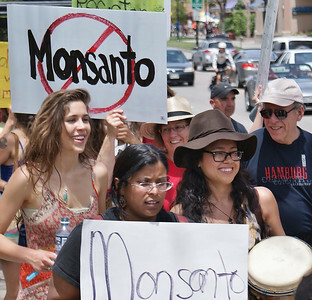 Young woman raises fist in air while marching, ant-Monsanto sign behind her. 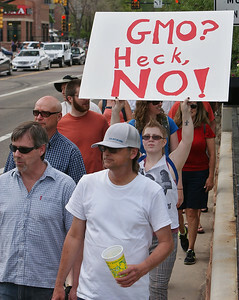 Protester marching with "hell no to GMOs" sign. 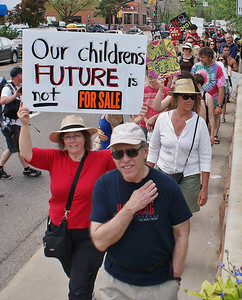 Woman raises about "our childrens future", line of marchers in background. 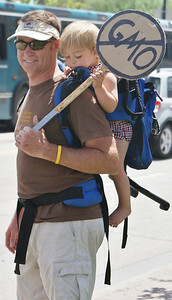 Young boy wears sign around his neck, "I am not a science experiment"
Father with anti-GMO sign carrying young child on his back. 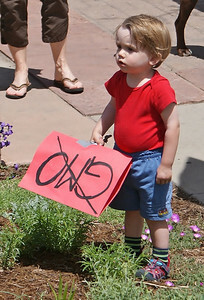 Little boy standing by himself, holding anti-GMO sign. 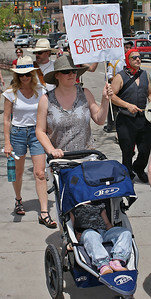 Woman holding sign about Monsanto and bio-terrorism, pushing child in stroller. 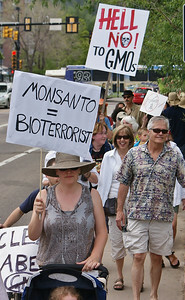 Woman holding ant-Monsanto sign about bio-terrorism, pushing young child in stroller. 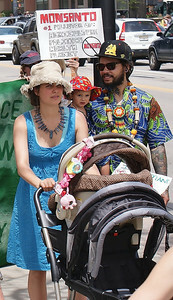 Woman pushing baby carriage, man carrying small child next to her, anti-monsanto sign in the background. 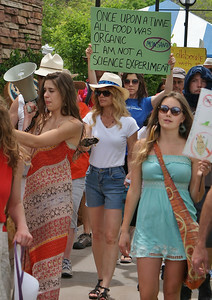 Woman holds sign about Monsanto and geo-engineering, other protesters behind her. 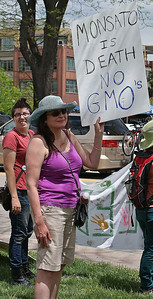 Woman in anti-GMO march holds sign about organic food. 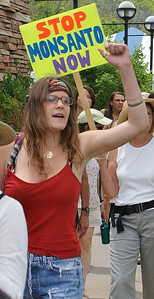 Woman marching with anti-Monsanto sign. 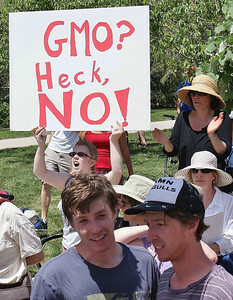 Young man with anti-GMO sign, many other protesters behind him. 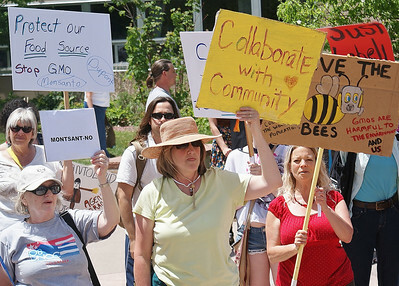 Woman holding sign about bees and GMOs. 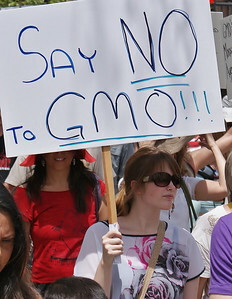 Woman shouts while holding ant-GMO sign. 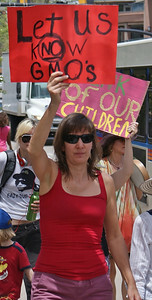 Woman holds sign above her head about organic food and Monsanto. Young man with sunglasses with march against Monsanto sign. Group of young women looking up at rally speaker, GMO protesters with signs around them. 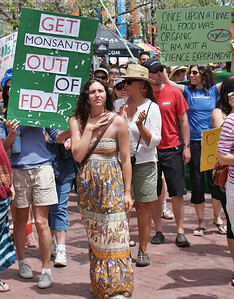 Demonstrators with sign about Monsanto and the FDA, woman protester in front of him. Protesters raises bullhorn in air, large group of protesters in background. 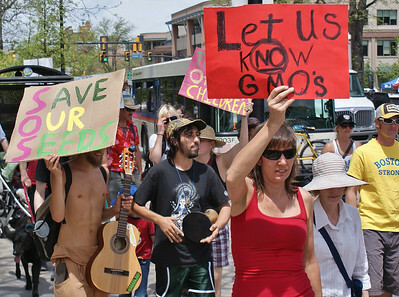 Group of protesters with anti-GMO signs, one with picture of a bee on it. 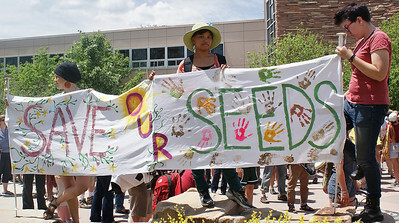 Young women holding sign, "Save Our Seeds". Young woman holds sign about poisoning food. 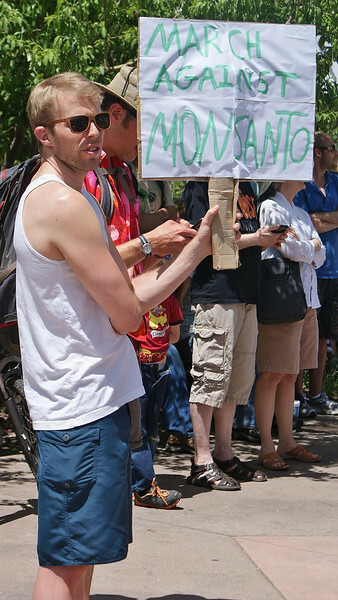 Protester with anti-GMO and Monsanto sign. 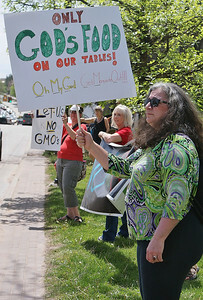 Woman with sign about "Gods Food", other GMO protesters in background. 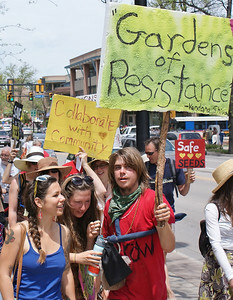 Group of young protesters with signs about gardening and seeds. 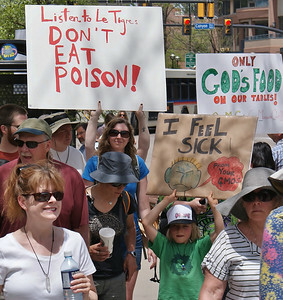 Marchers with signs about food safety, including young boy holding sign above his head. 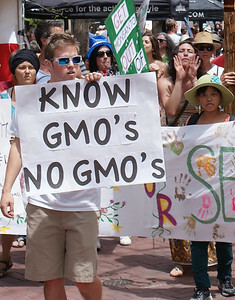 Woman raises sign about GMO labeling above her head, other demonstrators with signs march behind her. Young woman with bullhorn, protester marching behind her. 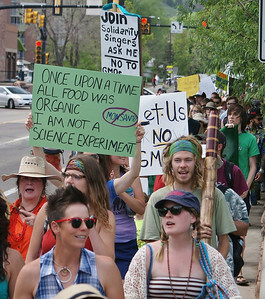 Protester with sign about organic food, other anti-GMO demonstrators marching. 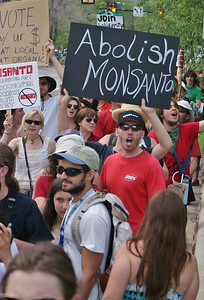 woamn hoding anti-Monsanto sign, other protesters in background. Man shouts, ant-monsanto sign behind him. 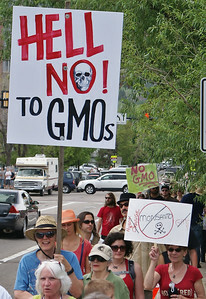 Woman raises ant-GMO sign above her head, other protesters in front of and behind her.